New South Wales is where our heart is. Let’s look at Wollongong; a city with a beautiful beachside location, close to schools, Wollongong University, a thriving central business district and some amazing cafes and restaurants. What are my options for building in Wollongong? When it comes to building your new dream home in Wollongong, you have two choices: you can knock down and rebuild, or you can purchase an empty block of land and build from scratch. To secure a special location or large block, buying an old home is often the best option to create your dream home. Purchase a vacant lot and build one of Mincove Homes’ modern home designs. Lifestyle: A perfect opportunity for a sea change or tree change, Wollongong offers extremely beautiful beaches and natural landscapes, while not being too far from Sydney. 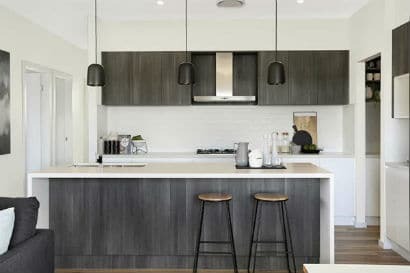 Shellharbour is only a 25 minute drive from Wollongong, and features the Illawarra’s largest display home village at Calderwood Valley as well as a third display home in the ever-popular Shell Cove estate. Any of Mincove Homes’ home designs would be ideal for the Wollongong area. Winner of the Master Builders Award for Best Display Home in the $300,000 – $400,000 range in the South East region. Cleverly designed for a narrow 30m x 10m allotment, this stylish home design creates a true sense of space over the two storeys. A standout statement without compromising on any essential design elements for modern family living.